If you ever find yourself looking up at your roof and you notice that it has been overrun with ugly black streaks all over the place, you can quickly find yourself with a roof that looks, old, beaten, and worn, no matter how old it really is. When this happens, don't panic in thinking that your roof is in need of repairs, as most times all it really needs is a professional cleaning from a team of highly skilled professionals. 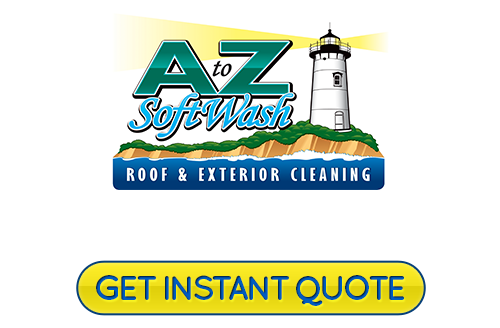 When you are looking for a high quality cleaning for your Rhode Island home's roofing, the only name you need to know is A to Z Softwash. 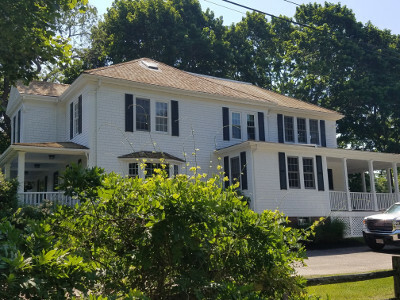 Our Cape Cod roof cleaning company is your local Middletown roof cleaning and pressure washing contractors that can deliver you the high quality cleaning you need to get rid of those unsightly areas on your roof and get everything back to looking like it did when it was first installed. Over our years of service in the area, we have helped plenty of homeowners restore their home's roofs back to their original beauty with our full line of effective and safe roof cleaning methods. Every one of our roof cleaning professionals are fully licensed, trained, and experienced, so you can always rest assured that you are getting the best when it comes to your service. When you are dealing with mold, algae, mildew, or lichen on your roof, the challenge is normally how to make sure you get your roof thoroughly clean without inflicting any damage to the roof itself. Pressure washing is a popular method, but when in the hands of someone without the knowledge and experience to know when to use it, and when not to, you could easily wind up with a great deal of damage to your home's roofing. The high pressures used in pressure washing can easily strip shingles or tiles right from your roof and damage the texture and finish of many other types. 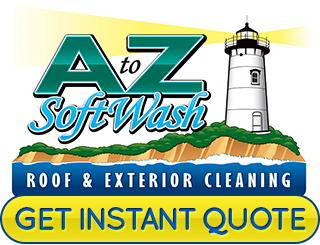 Our team of professionals here at A to Z Softwash can help you get the high quality cleaning you need without the risk of damage by utilizing our specialized soft pressure washing methods. This allows us to safely and effectively destroy the contaminants on your roof without causing damage to the roof itself. Give us a call today if you have any questions about our full line of professional roof cleaning or soft pressure washing services, or if you would like to schedule your appointment for service with one of our specialists. Our team of experts are always standing by and would be more than happy to take your call. Many homes here throughout the Middletown area have roofs that are composed of somewhat delicate materials. Roofs with wood shingles, custom paint, or original textures are just a couple examples of roof surface types that can be difficult to clean with more traditional methods. Because the potential for damage is substantial for more delicate materials like these, soft washing methods are often the only solution. Here at A to Z Softwash, our soft washing methods will ensure that you get the deep cleaning you need without the risk of damage that comes from harsher methods. In addition to all of our other great exterior cleaning services, you will be happy to know that A to Z Softwash can also take care of the windows of your home as well. Like all of our other services, our window washing service is a safe and effective approach that will leave you with sparkling windows, without the risk of damage the window itself or the surrounding trim. If you are looking for a professional roof cleaning and soft washing contractor in Middletown, give us a call today at 508-209-7795 or fill out our online request form.